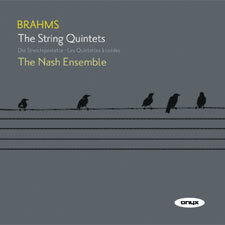 The Nash Ensemble continue their critically acclaimed Brahms series on Onyx with the two String Quintets. The op88 was composed after a remarkable burst of activity - the second symphony, violin concerto, Academic Festival and Tragic overtures, the second piano concerto had all appeared in the five years prior to the composition of the first quintet. Op88 was composed along with the second cello sonata, and the second violin sonata. Brahms was at the height of his powers. The first quintet although a favourite of his has been slow to gain public affection. The second quintet op111 dates from 1890, and Brahms had begun and abandoned sketches for his 5th and 6th symphonies, complaining that he found composition was becoming harder, and that he would stop altogether.Thankfully he was coaxed into re-thinking his decision by the clarinettist Muelfeld, and the op111 turned out not to be his final work. He did however write to his publisher 'With this note you can take leave of my music, because it is high time to stop'.